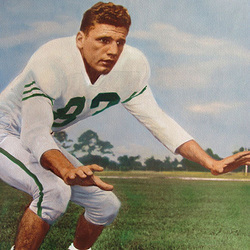 Head Coach Andy Gustafson called Leo Martin one of the most brilliant flankmen, defensive end, he had ever seen in his many years as football coach, and coaches and players also stated that Martin was the most single handed destructive force their teams had faced during the 1950 season. Martin had a terrific skill in breaking up opponents formations and along with his brute strength and reckless play made him one of the most effective players in the entire South. On many occasions, "Leo the Lion", warded off the entire line of the opponents blockers and sent the ball carrier to the turf. Besides being a destructive force on defense, Martin was an outstanding offensive player and ranked as one of the best, at the time, wide receivers the Hurricanes had ever fielded.